We are continuing our work to improve the air safety of Ansat, as it is actively used in the transportation of passengers and patients who require emergency medical assistance. Additionally, helicopters equipped with a ditching system will be able to conduct flights to oil companies' facilities located at a considerable distance from the coast, and participate in search and rescue operations above the water,” said Russian Helicopters CEO Andrey Boginsky. “Together with high performance, this will make Ansat even more attractive to fuel and energy companies and rescue services,” he added. 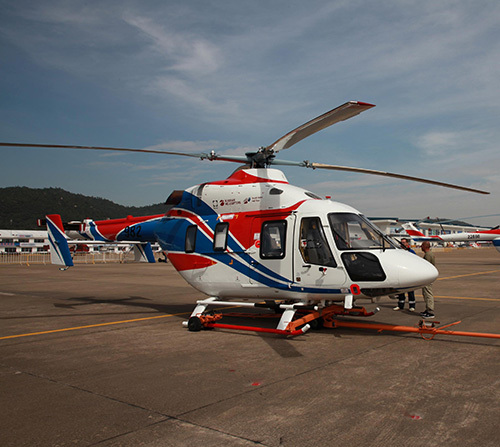 Ansat is a light, multipurpose twin-engine helicopter manufactured by Kazan Helicopters. According to the helicopter certificate, its design allows it to be converted into a cargo version or a passenger rotorcraft that can carry up to seven people. Ansat is certified for use at temperatures ranging between -45°С and +50°С. JSC Russian Helicopters(part of Rostec State Corporation) is one of the world leaders in helicopter industry, the only developer and manufacturer of helicopters in Russia. The holding company was established in 2007. The head office is located in Moscow. The holding company is comprised of five helicopter plants, two design bureaus, enterprises for production and maintenance of components, aircraft repair plants and a service company providing after-sales support in Russia and abroad. Among the buyers of the holding company’s products are the Defense Ministry of Russia, the Ministry of Internal Affairs of Russia, EMERCOM of Russia, and other state customers, Gazprom Avia and UTair airlines, as well as major Russian and foreign companies. Rostec Corporationis a Russian corporation established in 2007 to facilitate the development, production and export of high-tech industrial products designed for civilian and military applications. The Corporation comprises over 700 organizations that are currently part of eleven holding companies operating in the military-industrial complex and four holding companies working in civilian industry, as well as over 80 directly managed organizations. Rostec’s portfolio includes well-known brands such as AVTOVAZ, KAMAZ, Kalashnikov Concern, Russian Helicopters, VSMPO AVISMA, UralVagonZavod, etc. Rostec companies are located in 60 constituent entities of the Russian Federation and supply products to more than 100 countries.